I'm doing a lot of traveling around the south lately, which doesn't really seem fair given that I know literally dozens of people that are going to Europe, going on safari, and going seemingly everywhere around the world. It's fine though, since I get plenty of great lowcountry and Gulf Coast eats. Plus, it turns out that Father's Day, summer produce, and that southern inspiration make the perfect storm for a delicious dinner. 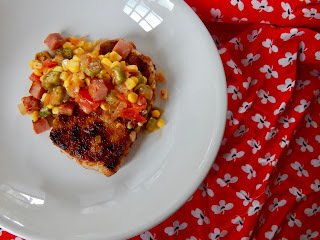 These pork cutlets (or pork chops, if you prefer) come together quickly with a fresh, summery salsa-esque topping for a meal fancy enough to celebrate Dad but quick enough for those weeknights when you inevitably make it again and again. The pork part of the dish is pretty simple. I whip up a quick spice blend with plenty of Louisiana kick and add a splash of oil to distribute it and let the pork soak up all the goodness. 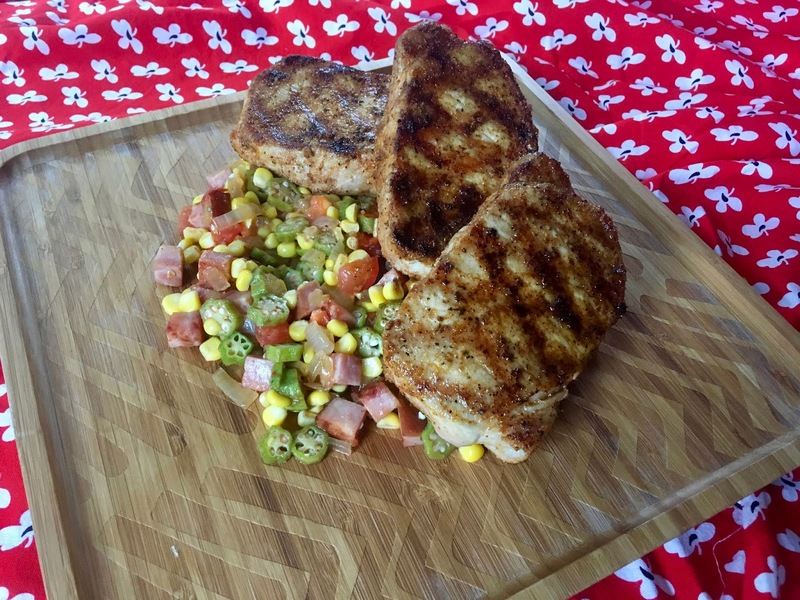 Tonight, I went with a boneless pork cutlet, but this recipe would work just as well with pork chops (bone in or boneless) or even a pork tenderloin. 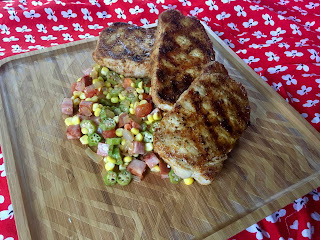 I thought these pork cutlets were tender and tasty, plus they cooked in less than 15 minutes and stayed perfectly juicy. I used a grill plate so I could stay indoors and still get a nice char, but other options include an outdoor grill or a big, heavy skillet. In all honesty, though, the pork is really just a vessel for this salsa/slaw/vegetable medley what-have-you. I'm still not sure what to call it; I just know it's one of the best ways I've come up with to get your veggies and take advantage of fresh, local, in-season produce. Like all the best veggie dishes, it starts with a bit of meat. 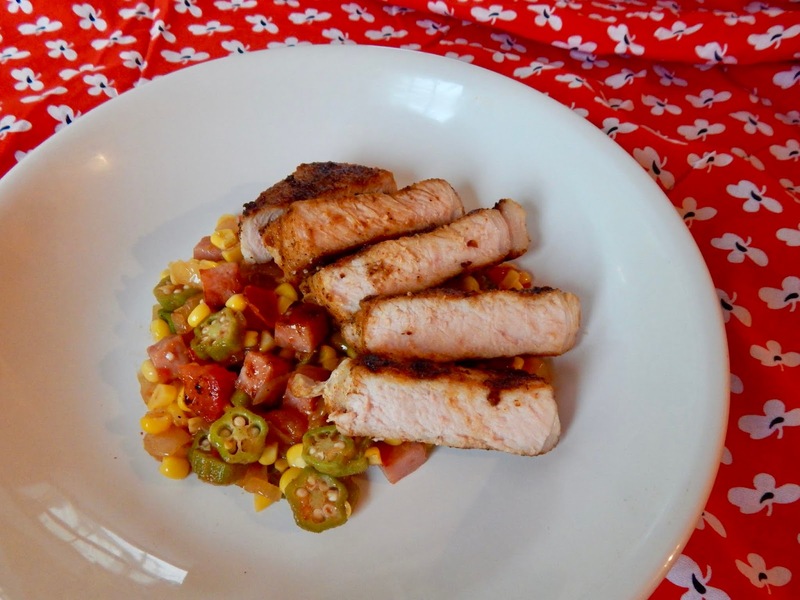 Here, I use diced ham to add texture and saltiness and enhance the flavor of the pork underneath. I cook off some onions in the flavorful ham fat as a base for the rest of the veggies. Corn and okra are up next: you might not be familiar with okra or you might think of it as a fuzzy, slimy thing you never willingly ate (sorry, Dad). 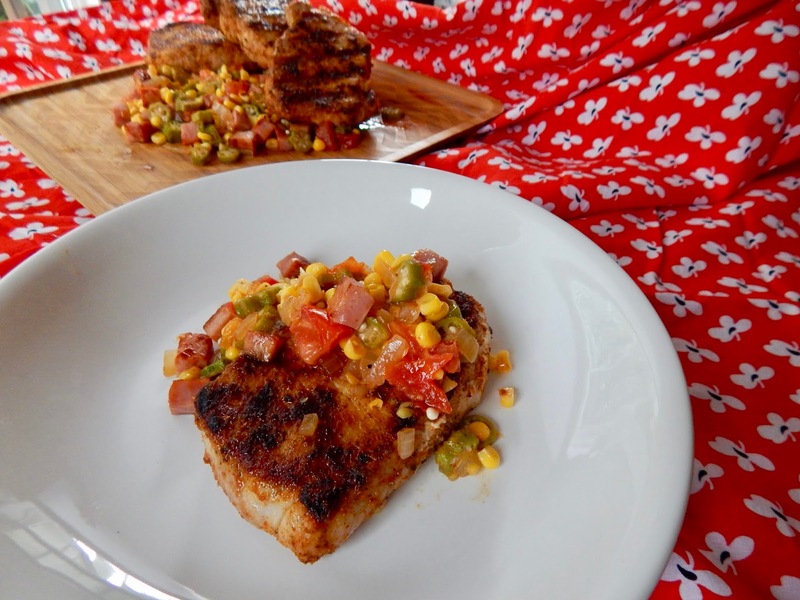 However, once you slice it thin and toss it with all these other vegetables and a hint of a dressing, it transforms into a delicate, tender bite that adds a pop of color and that unmistakable southern flair. Just be careful to serve it quickly after cooking because it can go from tender to gummy very quickly. The 'salsa' just needs to be finished with a handful of diced fresh tomatoes (as much as I love canned tomatoes, they're not the best fit here) and a drizzle of honey and apple cider vinegar. To kick it up a notch, you can add cayenne or minced jalapeno as well. To serve, I like to heap some of the veggies on a plate, top it with the pork, and spoon some more veggies on top so the juices drip down as sort of a mini sauce. It can be easily scaled up or down for any occasion, too. Just make sure you follow food safety guidelines by using different plates and grilling utensils for the meat to avoid cross-contamination, and refrigerate any leftovers quickly, though it's unlikely there will be much. There's a reason why foodborne illnesses spike in the summer, so don't let it happen at your cookout! I still have faith you can whip this dish up for Father's Day without any trouble, and you may even have time to make a frozen lemonade tart or caramel pretzel blondies for dessert. 1.5 lbs Pork Loin Cutlets, Pork Chops, Pork Tenderloin, etc. Combine the garlic powder, onion powder, paprika, 1 tsp cayenne, thyme, and oregano. Add salt and pepper to taste, approximately 3/4 tsp of each. Add 2T oil to form a paste. Add the pork and rub to coat evenly. Let sit for at least 30 minutes. Meanwhile, heat the remaining 2T oil in a large skillet. Add the ham and cook until crisp and browned, about 4 minutes. Remove with a slotted spoon and set aside. Add the onion to the remaining fat from the ham and cook until translucent, about 4 minutes. Add the jalapeno, if using, and cook for 2 minutes. 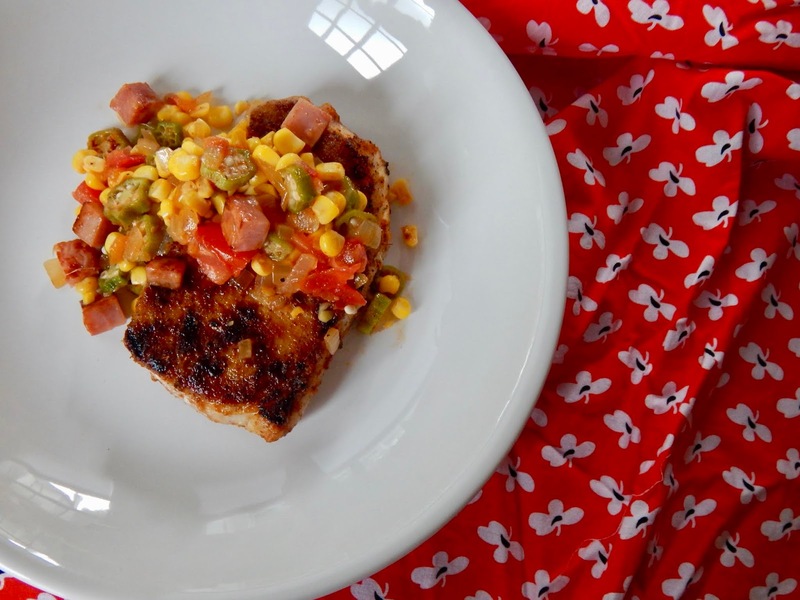 Add the corn kernels and okra and cook for 2-3 minutes or until just tender. Season with salt and pepper. Add the tomato, honey, apple cider vinegar, and remaining 1/2 tsp cayenne (to taste). Cook for 1-2 minutes or until heated through. Heat a grill, grill pan, or skillet. Add the pork and cook until cooked through, about 10 minutes total for cutlets. Let rest for a few minutes, then serve with the vegetables.